Thoughts on wine, food, and life. I don't know how I got from April to December quite so fast, but looking back, it was a good year for wine. Here are my favorites of 2010. Lastly, an honorable mention for Charles Hiedsieck Brut Reserve Champagne. A new find for me this year, I think this is a great value in non-vintage Champagne and tasty to boot. We had a great group with Geary, Sandy, Shane, and Christina. We started off trying to pair the wines with courses, but pretty much gave up after the second course. Whites enjoyed with the first couple courses. Bright garnet translucent in the glass. Smoke and black cherry fruit o the nose. Rich. Medium to just full bodied. Finishes with a slight cola spice note and some light tannins. I didn't get to spend as much time as I would have liked with this, and it was served a touch too warm it seemed, but this is nice. Tasted this briefly at the end of a long dinner tasting. YMMV. Reticent herbal plum nose. Savory and somewhat taut after the Cali wines we'd been tasting. Not bad. 13.5% ABV. Light amber in the glass. Bright fruit on the nose with light botrytis and nectar. Medium full bodied and medium sweet with more nectar-like flavors on the palate. Pretty good. So it was a full six days before we got an opportunity to complete round 1 of my argon wine preservation test. I made the preparations last Tuesday, and here it is Monday night as we sit down to taste what happened. In preparation, I opened the fresh bottle and poured off enough so that all three bottles had about the same fill. I put each in a paper bag and then asked Mona to mix them up and label them each with either A, B, or C. Neither of us knew which bottle was which. Argon Experiment - Bottle A - Dark garnet with a translucent rim. Reticent cedar on the nose. Medium full bodied and fairly soft with black currant and sweeter black berry fruit. Argon Experiment - Bottle B - Dark garnet with a translucent rim. Black currant fruit and secondary cedar on the nose. Still somewhat reticent. A touch of extra spice on the nose. This seemed to show a sense of extra acidity and better verve than bottle A. Black currant and sweet berry fruit. This was our consensus favorite. Argon Experiment - Bottle C - Dark garnet with a translucent rim. Bit funky smelling with a notion of rubber, alcohol, and pepper. Overall somewhat reticent nose. Soft black currant with a bit of red fruit liqueur. Mona suggested a little earthiness. This is a bit innocuous. Consensus least favorite. In hindsight and light of the unveiling, I think this is a bad bottle. After the unveiling, we were pretty shocked. Clearly I need to rethink which wines to test with. I would not have expected a recorked bottle to be in this good of shape after six days open. I also think that the fresh bottle was off in some way. It didn't taste like any of the bottles of this wine I have opened previously, including the fresh components from Bottles A and B when I made arrangements for the test. All three wines were completely drinkable, but we both preferred Bottle B to the other bottles and least liked bottle C.
I guess the wine I chose was youthful enough and with enough structure to withstand sitting relatively exposed for six days without significant decline. I think for my next test I will have to choose something a little more fragile. Furthermore, the way Bottle A tasted, makes me question whether the argon may be doing some damage to the wine's aromatics. Things to think about, for sure. The esteemed Chateauneuf du Pape author Harry Karis came through town and Howard was kind enough to arrange a tasting for us to meet him and enjoy a few wines. The theme was Rhone varieties, not from the Rhone, but we had some stunning actual Rhone wines thrown in as well. 12% ABV. Quick impression. This seemed to have a relatively light bead and low effervesence. Sweet smelling with baked apple aromas. Similar ripe apple fruit on the palate. I found this to be relatively "sweet" for a Brut, which is okay with me. Good. This paired fairly well with a caramel bread pudding. Dessert Sticky - Reticent fruit cocktail nose. Medium bodied with rich white and stone fruit. Sweet, but not cloying. Flavors like a Sauterne, but with a bit less botrytis and a lighter moutfeel. Pleasant. There is a fair amount of discussion among the wine geek set about how to best preserve leftover wine for later consumption. Pretty much uniformly everyone agrees that pouring the leftovers into a container that is precisely sized to accommodate the leftover wine without any air exposure is the ideal method. For example, pouring the leftovers into 375ml stelvin (screw cap) bottle right up to the top and then screwing on the cap. Others have suggested filling a plastic water bottle with the leftover wine and then squeezing out the air before putting the cap on. I like both of these methods, but they have a few drawbacks. First, you may not have sufficient leftover wine to make this method work, at least if you focus on the 375ml method. Second, you may forget which leftovers are in which bottle if you have a few laying around. Finally, I think pouring off the leftover wine does introduce some air into the wine, which might be detrimental in some cases, such as for older vintages. We visited Tom Anderson at Anderson’s Conn Valley in 2008 and he was an advocate of using argon. 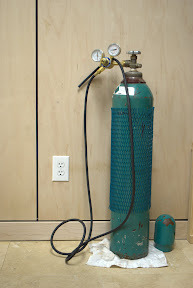 I was familiar with people using nitrogen systems (like Private Preserve), but Tom just had a 2 foot high canister (think scuba tank) of argon at his feet that he used to top of the leftover bottles after we had tasted them. I started paying more attention at the wineries I visited and noticed tanks of argon laying around frequently. Using argon has the advantage of letting you keep the wine in its original bottle and in theory would be effective for almost any amount of leftover wine. Sparked by this new observation on my part, I picked up a canister of argon at home to try out. I’ve been using it now for about two years. The tanks are big enough that I have only had to replace it once in that time period and the price is very reasonable relative to the small consumer tanks. There is an initial investment in a regulator, but you can amortize this over time if you plan to use the system for long. Replacement tanks of argon run about $40 in my neck of the woods from Air Gas. The regulator set me back about $120 if memory serves. Bottle 1 – Decant half the bottle and apply argon to the leftovers and re-cork. Bottle 2 – Decant half the bottle and simply re-cork. Bottle 3 – Keep unopened for comparison when we get back to check the results. 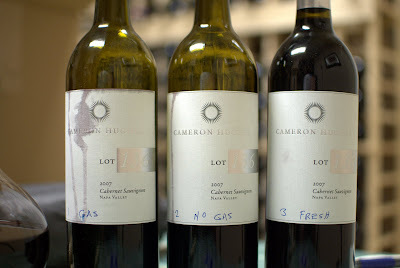 I selected three bottles of Cameron Hughes Lot 136, a 2007 Napa Valley Cabernet Sauvignon for my test and made preparations last night for the future test. I’m still trying to decide how long to wait before for tasting the wines. I think two days at a minimum and three to five days as probably the sweet spot. Seeing as it is Wednesday and I made the preparations last night, I think we will taste the wines on Friday or Saturday, schedule permitting. I plan to have my lovely wife Mona help ensure that I don’t know which bottle is which in the tasting. We will decant half the unopened bottle and set the decanter aside so that the bottles will all be the same weight (no clues permitted!). Hopefully I can recruit another palate or two to corroborate the results. This test won’t be able to measure the impact of repeated opening and refilling with argon. That’s another, more difficult test entirely. I came across the following quote someplace. "Never lose sight of the fact that it is just fermented grape juice." I think this must have been a winemaker's candid advice to a consumer. I think it is great advice and I keep coming back to. It helps me put those $100 bottles in perspective. Over on the Freakonomics Blog author Robin Goldstein has written a short note about wine pricing. He argues for supply-side pricing (cost based) instead of demand/market based pricing. I suppose I would prefer supply-side pricing too, but I think Mr. Goldstein has ignored a basic tenet of supply and demand. A winery is going to raise prices if it routinely sells all of its wine quickly. It would only be rational, which as an aside sometimes makes me wonder about the sanity of one of my favorite wine makers, Mike Officer of Carlisle but that's another post. I get that wine is not a commodity and the average consumer has trouble comparing the quality of one label to another, fragmenting the market, but the market for wine, such as it is, has been around for some time, and that has to say something about its relative efficiency, particularly in the age of internet, now that price comparisons are much easier. Am I missing the point of his post? Jeb Dunnuck just posted the third issue of his wine review newsletter, The Rhone Report. I learned about Jeb's newsletter around the time of the second issue and I immediately noticed that he and I share similar palates, particularly when it came to some of the Rhone Ranger reviews. What I find amazing is that he has the time and money to make this newsletter happen. The latest issue is 174 thoughtful reviews on wines from the Rhone, Spain, and California. He's obviously got a serious passion for Rhone wines. Check it out. I subscribe to a number of wine mailing lists. For a variety of reasons, they all seem to distribute their mailers clustered around certain times of year. Primarily January-February and July-August in my experience. I'm on more lists than I want to admit, and there's not enough money to go around for me to buy wine from all of them. These are all wineries I like or am curious about, but inevitably, some are going to get skipped this go round. As I was paring my list this January, I was contemplating dropping Rhys Vineyards, a small producer in the Santa Cruz area. I've only received one earlier mailer from them having joined their waiting list around 2008. 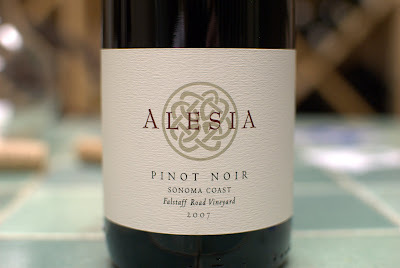 I'd opened a couple of their second label Pinot Noirs (Alesia) and found them competent, but in a style that is less fruit driven and more earth driven, which generally doesn't appeal to me. To help me decide whether or not to skip Rhys this time, I decided to pop one more bottle (trying allocate my wine budget is hard work!). This time I settled on the Alesia Falstaff Road Pinot. In short, I expected, (even hoped in light of the mailer in my inbox), not to like this, but it turned out to be one of the best Pinot's I've had lately. Little pricey for a second label, but very good. I think I was expecting something less fruit driven and was pleasantly surprised. My conundrum continues.